In 2010 we were commissioned to make an address number insert for a new home in Central Alberta. 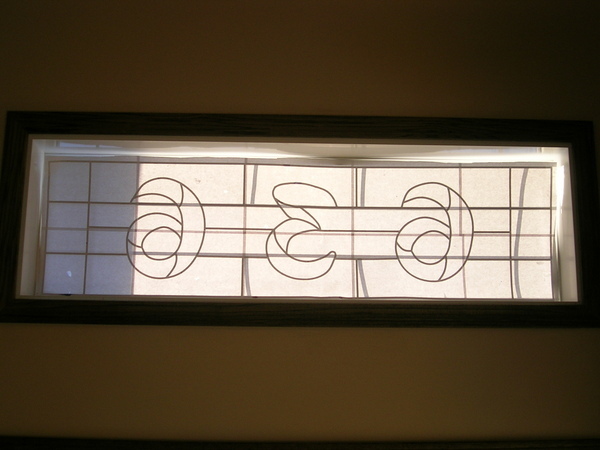 The #’s were made from a dark brown Bullseye glass with clears surrounding which let in lots of light but prevent a clear view into the home from the outside. 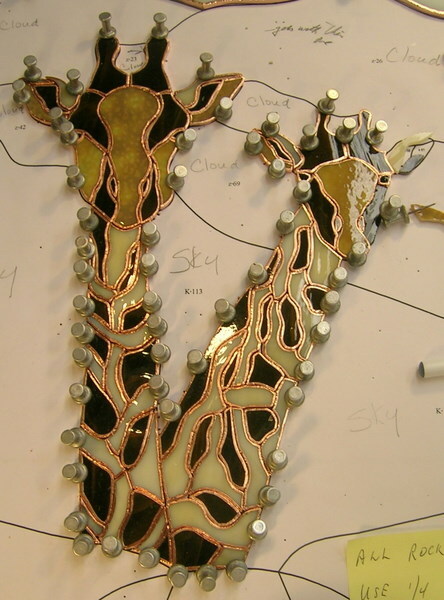 This picture shows the finished unit before installation in the home. 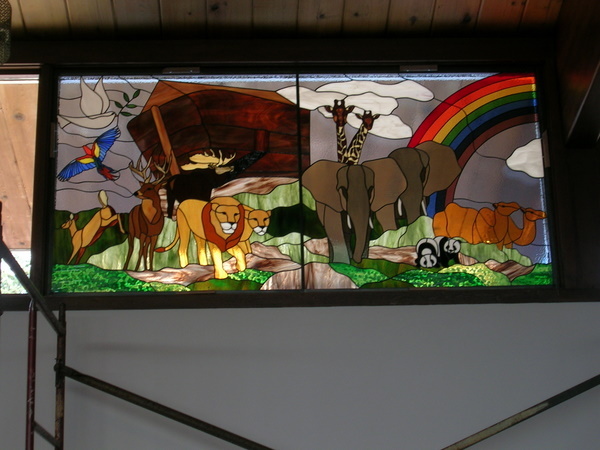 The next picture is the design as seen from inside the home, we aligned the design sections to match the internal bars inside the dual pane window. 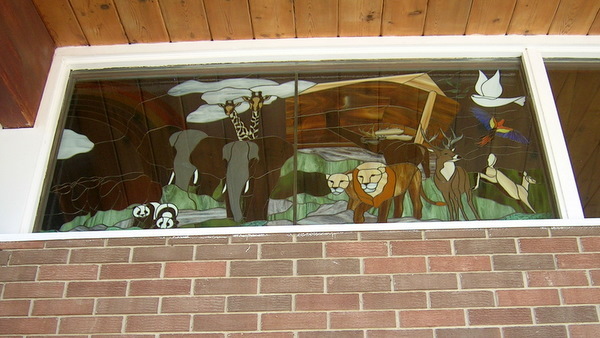 The 3rd picture is a view from inside the home, the address panel was put over the front door. With an elevated bi-level home the new panel also addressed issues of privacy especially during evening hours. 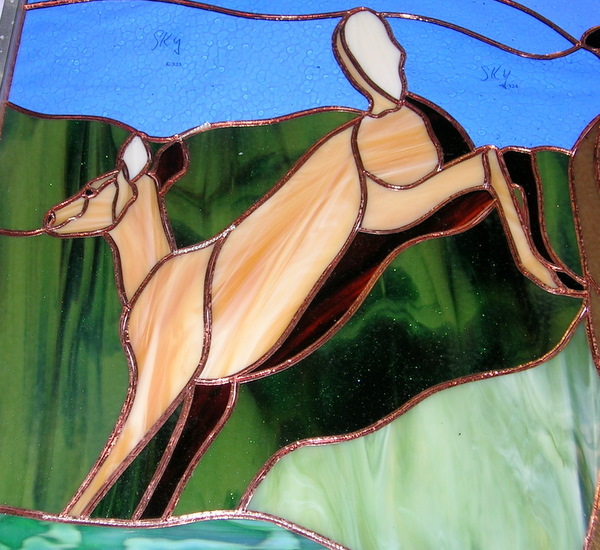 The other opaque clears matched and complemented the existing door and side panel glass. 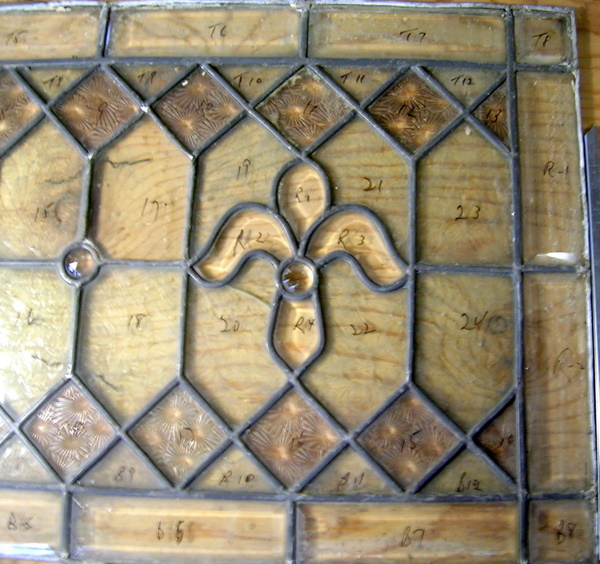 This is an old came window which was in good condition considering its age and where it had been. 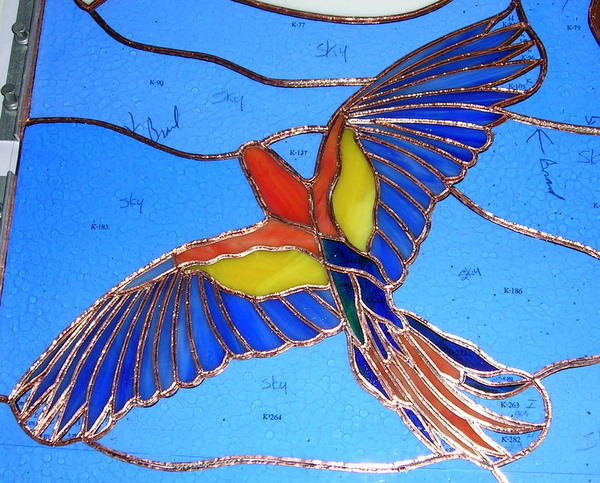 Our clients wanted to change the yellow/green glass to blues, retain the original frame which was going to be installed inside their home. We are unsure as to it’s age and origin. 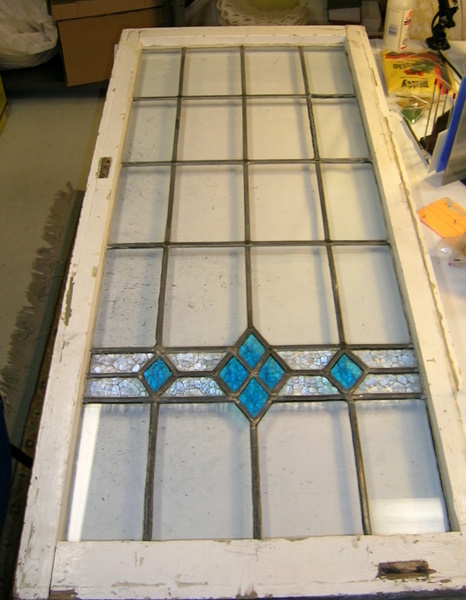 Here is the reconstructed and restored window with the new blue glass and mounted in it’s original frame. 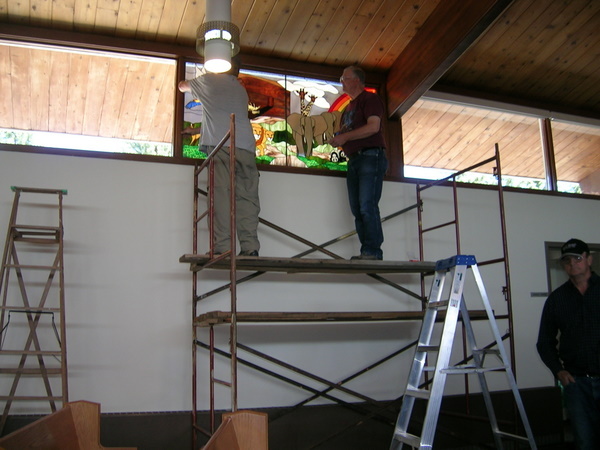 This picture shows the window taken out of the wooden frame before we replace the colored glass. 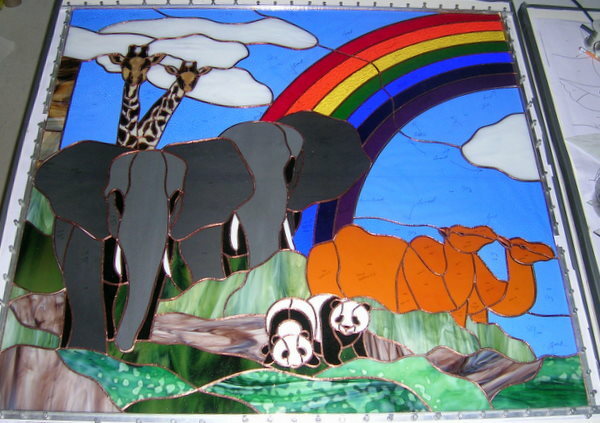 This is the first window we made. 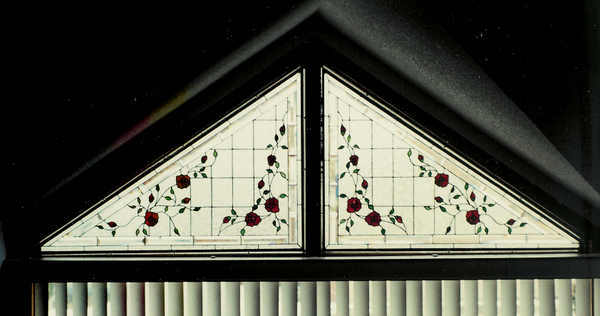 They were triangle in shape, located over a large living room window. The dinning area was elevated and the shape of these windows made it difficult for window coverings. 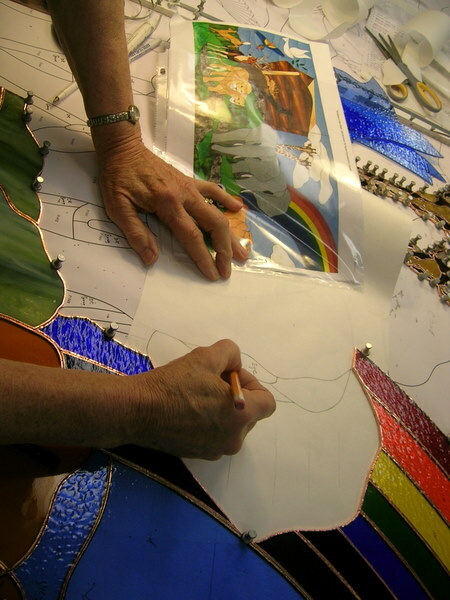 The stained glass still allowed lots of light but provided privacy for the home owners especially in the evenings when the house lights were on. 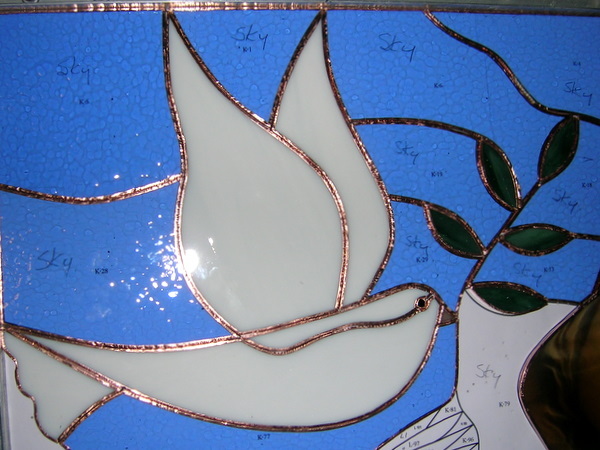 We used a pink Bullseye Glass that shows red during the day and pink at night depending on one viewing from inside the home or from outside looking in. Unfortunately we did not have the benefit of a digital camera in 2002 so do not have the best photos. 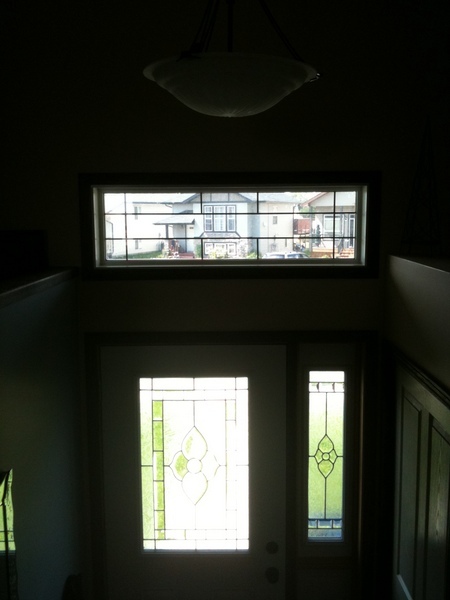 Our clients a number of years later sold this home in Edmonton and had to leave these windows behind but the new owners were happy they did. 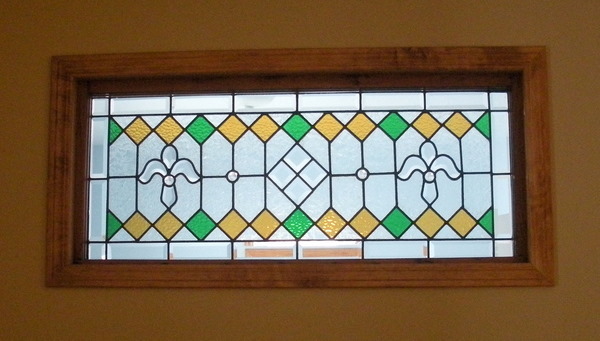 This window came out of a home in Saskatchewan and is some 80+ years old. 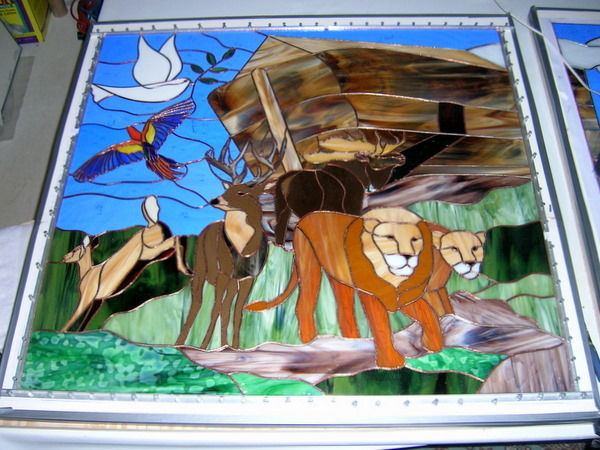 Our client wanted to have us completely restore it and add some colored glass. The window was in such poor condition that it had to be brought to us on a board. The came was completely rotten. 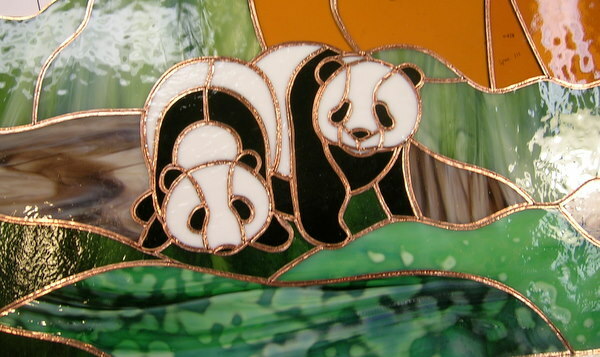 It had been repaired many years ago with some of the frosted glass being replaced with clear glass, not to mention several pieces broken. 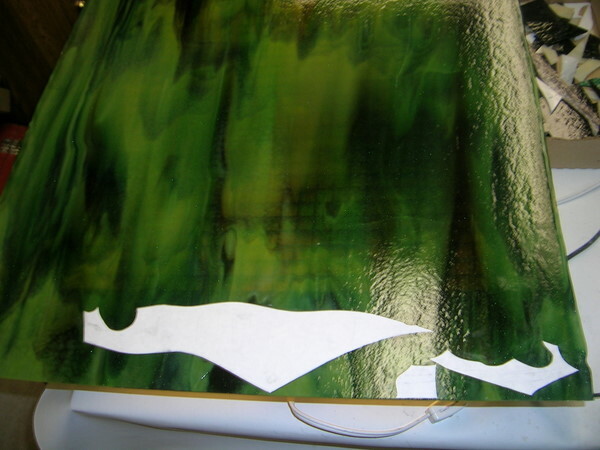 Fortunately all of the bevels were in good condition, as they appeared to have been hand made those many years ago and the angles were not consistent as with today’s machine made bevels. In addition they were quite thick vs today’s bevels. 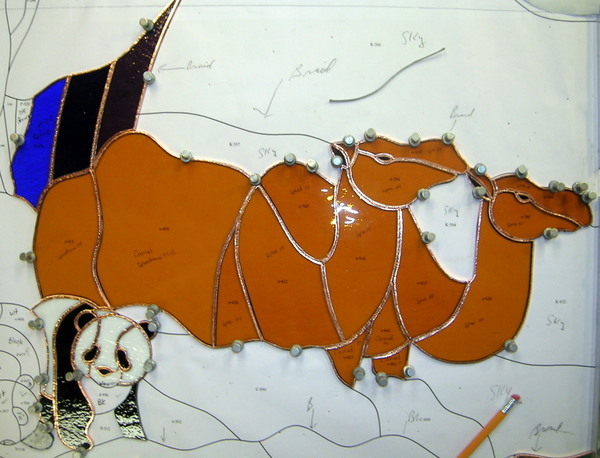 We number each piece of glass and take lots detailed photographs to assist in reconstruction. 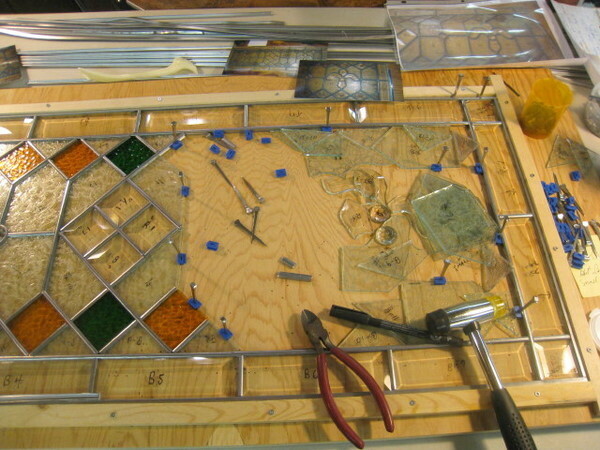 Here is the window being rebuilt. 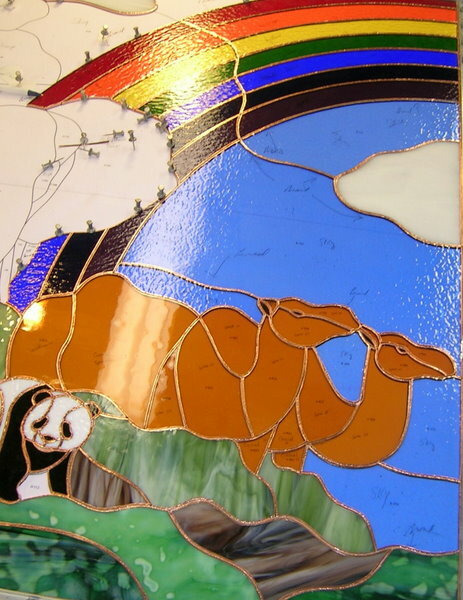 It was a came window and our clients wanted to add some gold and green colored glass. 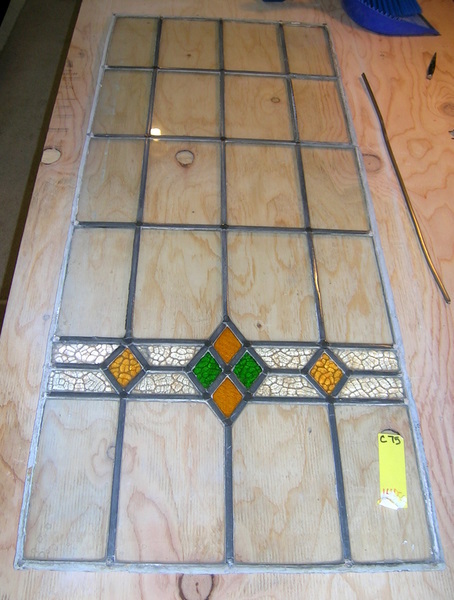 The window has now been rebuilt with new came, along with the change to the colored glass and is ready for soldering. 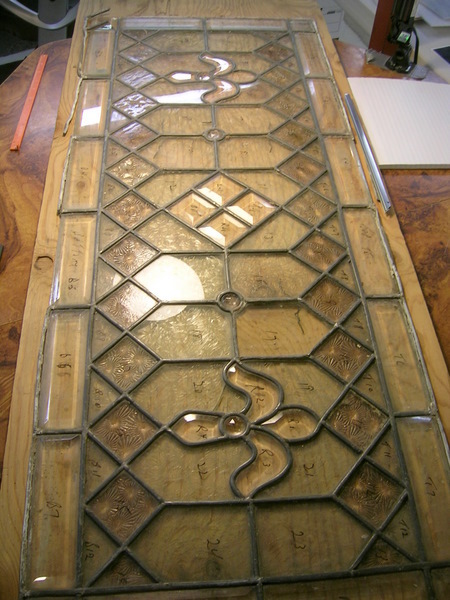 The next picture shows the window completely restored, soldered with the glass cemented in. 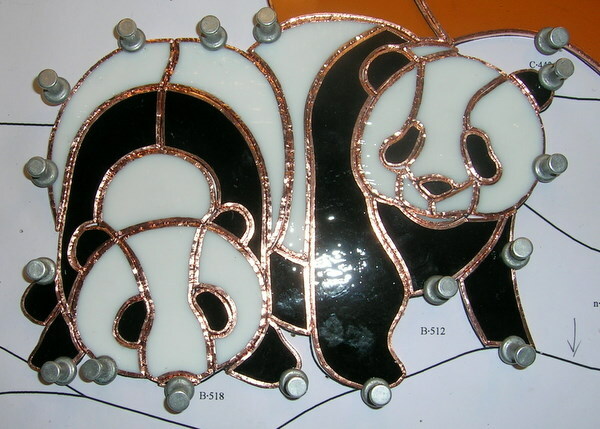 Then after cleaning we applied black patina to all of the solder lines, cleaned again and then applied stained glass polish. 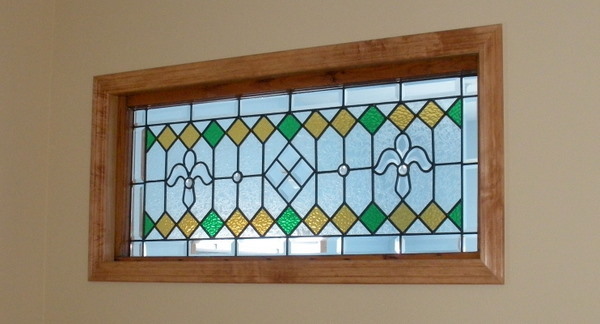 Our client then mounted the window into a new wooden frame which was located on an interior wall of their new home in Central Alberta. The window is high up from the floor and on one side is their master bed room and the other side a hallway. 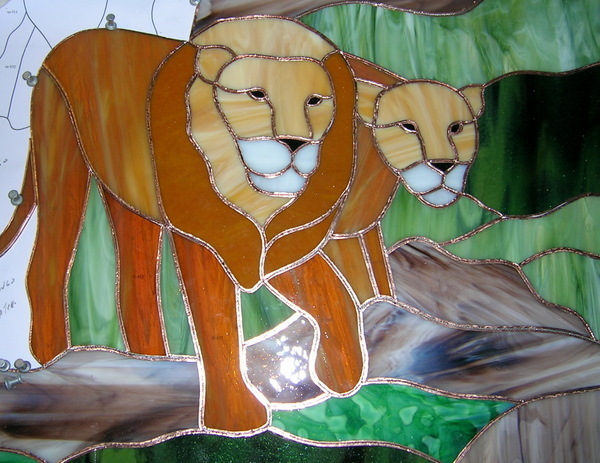 Weather will never be a problem but with natural light on both sides it provides an impressive sight not only all day long but also at night when either room or hallway lights are on. 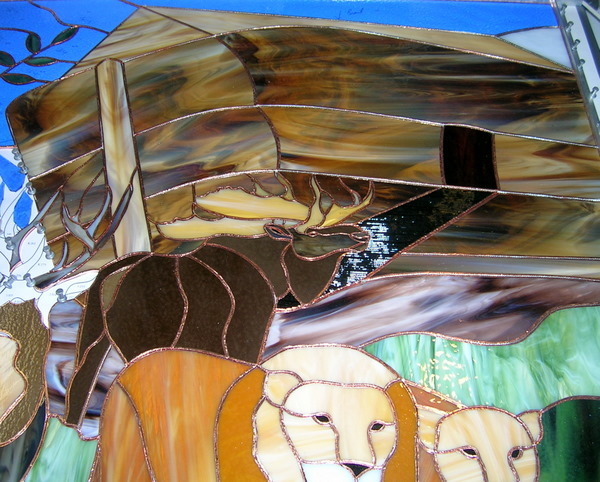 Here is a final picture of the window. 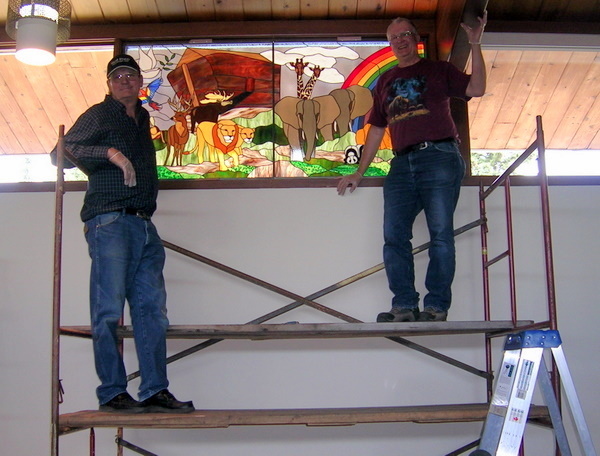 Our client was extremely pleased with the end result and a 80 year old stained glass window has a new life for many years to come, along with much enjoyment for it’s owners and their relatives and friends that visit their home. A piece of Prairie history has been saved.